From Martin Cruz Smith, author of Gorky Park and Havana Bay, comes another audacious novel of exotic locales, intimate intrigues and the mysteries of the human heart: December 6. Set in the crazed, nationalistic Tokyo of late 1941, December 6 explores the coming world war through the other end of history's prism -- a prism held here by an unforgettable rouge and lover, Harry Niles. In many ways, Niles is as American as apple pie: raised by ultra-protective missionary parents, taught to honor and respect his elders and be an upright Christian citizen. But Niles is also Japanese: reared in the aesthetics od Shinto and educated in the dance halls and back room poker gatherings of Tokyo's shady underworld. As a gaijin, a foreigner -- especially one with a gift for the artful scam -- he draws susupicion and disfavor from Japanese police. This potent mixture of stiff tradition and intrigue -- not to mention his brazen love affair with a Japanese mistress who would rather kill Harry than lose him -- fills Harry's final days in Tokyo with suspense and fear. Who is he really working for? Is he a spy? For America? For the Emperor? Now, on the eve of Pearl Harbor, Harry himself must decide where his true allegiances lie. 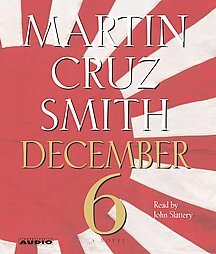 Suspensful, exciting, and replete with detailed research Martin Cruz Smith brings to all his novels, December 6 is a triumph of imagination, history, and storytelling melded into a magnificent whole.